Here is the latest addition to The Project Bin stamp collection, Spring Zen. You are going to love the three beautiful images you can color in for the spring with some amazing sentiments. 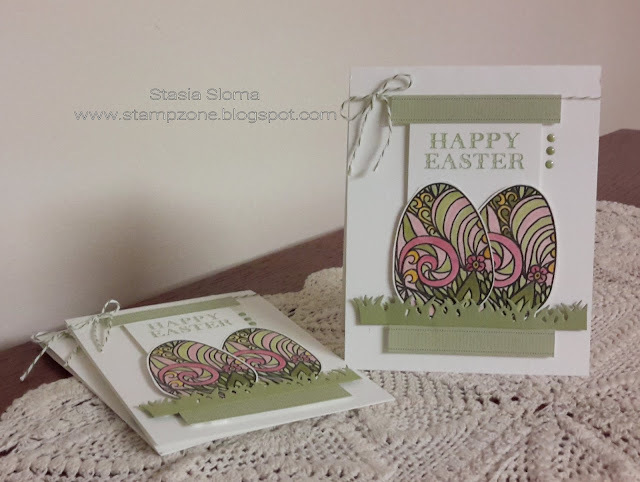 Here are the Easter Egg that I colored in with my Stampin' Blends. I just love the pink and greens together. The grass die cut comes from Impression Obsession. The strips of green come from my retired Simply Scrappin' kits, remember those! I wish they would come back they were so much fun and made scrapbooking so easy. Enamel dots and baker's twine complete the card.